The Avi Controller and Avi Service Engines (SEs) use SSH for secure management communication. The communication falls into two categories, Controller-to-SE, and administrator-to-Controller. This article focuses on the former. To create an SSH user on the Avi Controller, use the following steps. Note: An SSH user and key that already exist can be used. They still must be added to the Avi Controller using these steps. When creating the user account, the existing key for the user can be added by copy-and-pasting it or by importing the key file. Navigate to Infrastructure > Settings > User Credentials. Enter the SSH user name (example: root) in the SSH User field. 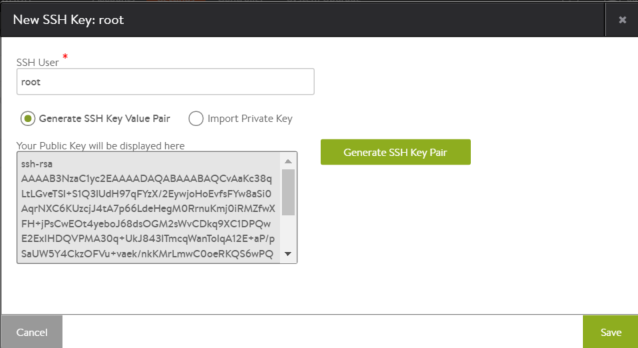 Click Generate SSH Key Value Pair to create a key pair for the user. Note: If the user already exists, you can add the user to Vantage by entering the user name on this dialog, selecting Import Private Key, and either copy-and-pasting or importing the key file. Navigate to Infrastructure > User Credentials. Click the download icon next to the row for the SSH user.